The REVO is the latest in a line of ornamental mills from Legacy that enable a wide range of wood machining operations to be carried out with a router in the overhead position. 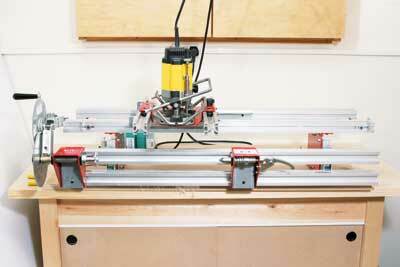 The router is mounted (right way up) on a carriage, which, in turn, runs laterally on rails. The carriage can also be moved across the width of the machine which, together with the router's plunge, gives movement in all three axes. 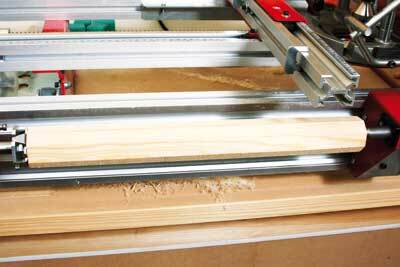 The result is to allow three-dimensional machining of wood in a very wide range of applications. The REVO is the smallest model in the current range but it would be wrong to think of it as just a stripped-down budget version of the larger Legacy machines. 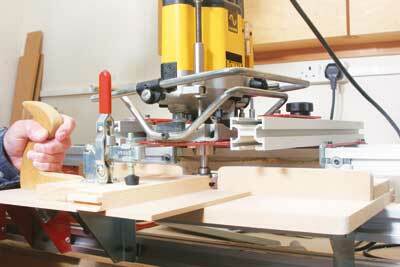 It has a number of features that make it an exceptionally versatile wood-machining centre. Apart from turning spirals, rope twists, barley sugar twists etc. for which Legacy mills are famous, the REVO can be set up as a router table, a tenoner, dovetailer and finger jointer, panel raiser, template follower, and many other operations. In fact, I can imagine it being the centre of a woodworking shop without using its turning facilities. The REVO comes in two cartons and has to be assembled. One carton contains the 4ft long alloy extrusions and wormgear that make up the main framework, the other the brackets, gearing, router plate, headstock and tailstock, and hardware for assembly. Instructions are on a DVD which, not having a TV or laptop in the workshop, meant that we did most of the sub-assembly sitting on the carpet in front of the TV. Assembly is not a five-minute job but it only has to be done once and will repay care and attention to detail. The assembled device takes up about 1,200 x 600 mm (4 x 2ft). We mounted it on an extra-large baseboard so that we could clamp it to a bench top or move it elsewhere if required. We actually made a bench especially for it, but that's another story. 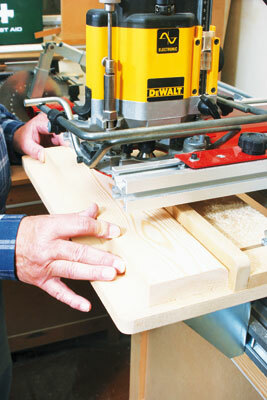 Any plunge router can be used, but a 1/2in model is necessary to get the most out of the REVO. Other useful features are a simple switch, a good collet, smooth plunge and solid plunge lock. We installed my DeWalt DW 625, to which I have fitted not only the WoodRat PlungeBar but also the Router Raizer fine height adjuster. In addition we used the Xtreme Xtension collet extension, which, apart from giving extra cutter reach, makes cutter insertion and removal very quick and easy. These are admittedly luxuries, which you can do without, but they make using the REVO even more of a pleasure, photo 2. 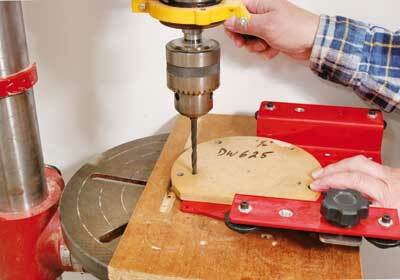 The router plate has to be drilled to take the router. We centred the router on the plate's aperture with a circle of MDF cut with my homemade small circle cutter, and marked the outline of the base on the plate. 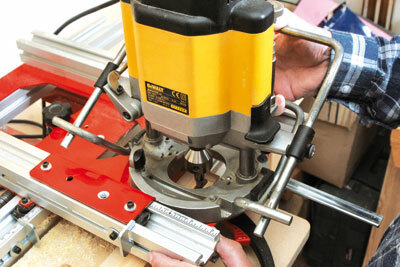 We then used my MDF router base pattern as a template to drill the three holes for the fixing screws, photo 3. Spindle turning is carried out with the workpiece mounted horizontally between headstock and tailstock at the front of the machine, photo 4. 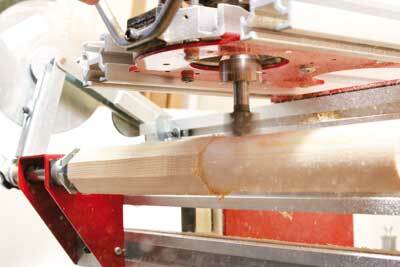 Maximum capacity is 150mm (6in) diameter and 93mm (32in) length. Note that we have removed the corners with a saw. This might make the turning purist blench, but doing so reduces wear on the router and cutter and drastically reduces the amount of shavings produced. To make the cut, the workpiece is rotated with the drive handle while the router is traversed the length of the workpiece in a series of light passes. A flat-bottomed cutter is used to reduce the workpiece to a cylinder, photos 5 and 6. After initial rounding, the required shape, e.g. rope twist, barley sugar etc. is cut into the workpiece by fitting the appropriate cutter and connecting the gearing at the headstock end, photo 7. As the gear handle is turned, the workpiece is slowly rotated and the router simultaneously traversed along the workpiece by means of the wormgear, photo 8. 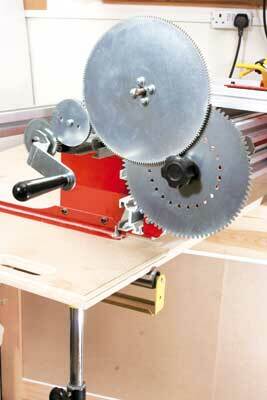 A reversing gear, included in the standard kit, enables left or right spiral cuts to be made. 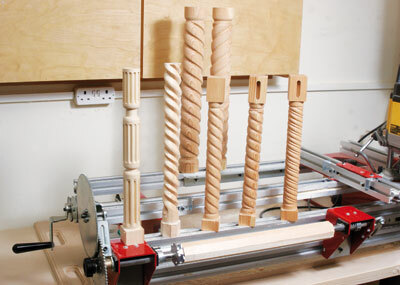 Spindles can be tapered by raising or lowering one end of the front rails. A table of values to give required tapers is available as a download from the Legacy website. An engineer's square makes an accurate gauge for adjusting the rails, photo 9. Being US-made, the REVO is manufactured to imperial dimensions, therefore the gears work in inches. 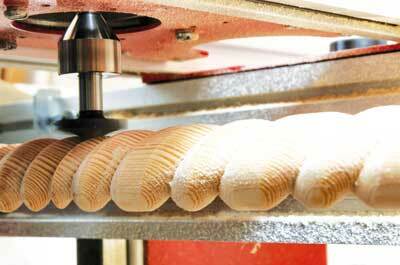 For best results, cutters for the various twist turnings should also be made to imperial measure. A range of such cutters is available from the UK Legacy supplier. An important feature of the REVO is an indexing wheel, which can be seen in the picture of the gearing. 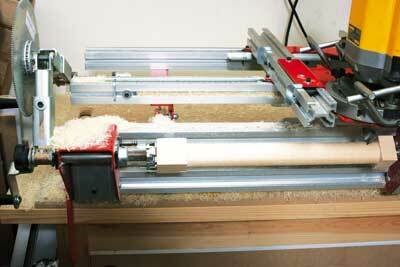 This offers 24 positions in which the spindle can be locked for fluting, square tapers etc. 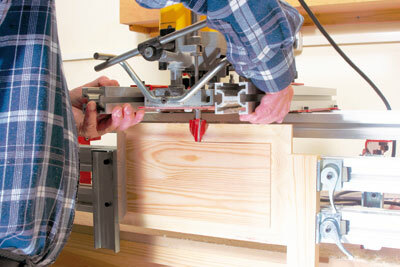 It also enables mortises to be cut in table legs, photo 10. 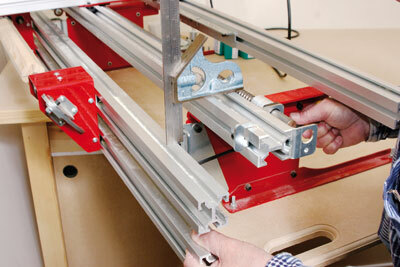 A vertical clamp is part of the standard kit and allows work to be clamped vertically to the front rails. This enables jobs such as tenoning, panel-raising, finger jointing and dovetailing to be done - the last two with the appropriate templates. 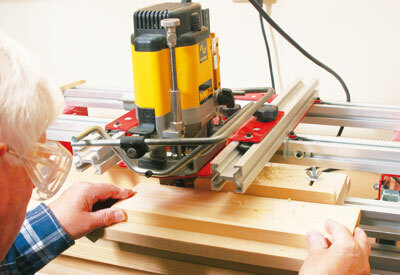 When tenoning and panel raising, the cut can be made in the 'wrong' direction, i.e. with the rotation, by engaging the wormgear and winding the workpiece past the cutter. 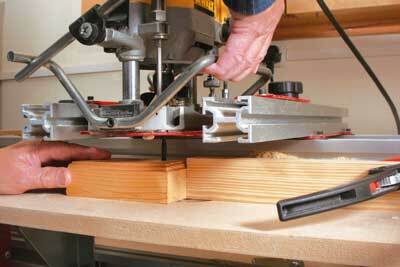 This gives an absolutely crisp, splinter-free edge to the cuts, photos 11 and 12. 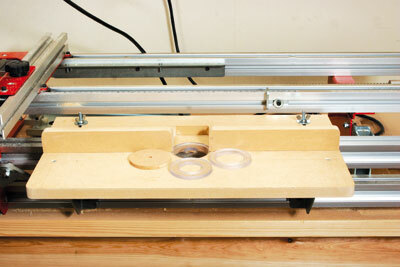 A simple router table can be made to attach to the REVO by means of two brackets that come as standard. The table can be the full length of the front rails if desired but much cabinet work can be done with a small version. Ours measures 500 x 275mm and we made it a simple fence plus a number of reducing rings for the cutter aperture, photo 13. 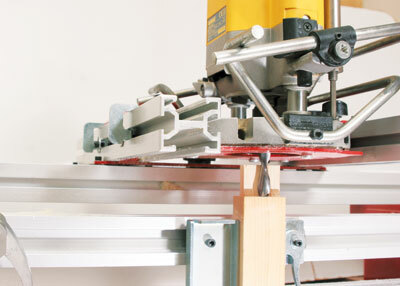 With the router overhead, the table can be used for operations such as edge moulding, biscuit jointing, mortising, scribing door rails, and drilling. These operations are greatly facilitated by the combination of PlungeBar and Router Raizer on the router (see photos 14, 15, 16, 17, 18). 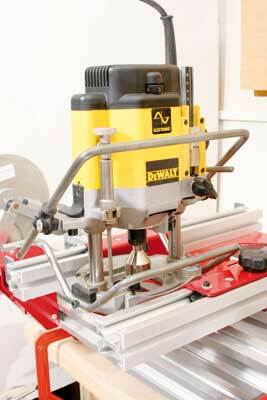 Drilling is also facilitated by the growing number of drill bits made to run at router speeds. Ours came from Wealden Tool Company. The above applications far from exhaust the uses of the REVO. The standard kit comes with a template follower, which enables curved shapes to be duplicated. There are optional accessories including templates for dovetails and finger joints, a turntable for circular work, and a design kit for laying out ornamental turnings. The REVO holds many other possibilities that we are looking forward to exploring. The REVO provides an extremely versatile woodworking centre at a price which compares favourably with an average saw table or planer thicknesser. Apart from most of the orthodox router applications, it provides a turning facility that is likely to open the eyes of turners and non-turners alike. The Legacy website includes many ideas and plans for projects, plus a free e-mail tuition service.